Although the Viscaynes had disbanded by the time their music hit the airwaves, Stone had solidified his decision to continue pursuing a career in the music industry. Is there a better early '70s R&B tune than "Que Sera, Sera"? A thick, swaying, slow-burning groove peppered with bubbly bass, gospel-tinged harmonies, church organ and tasteful bits of wah-wah guitar, the song, arguably the best track on Sly & the Family Stone's 1973 funk-pop masterpiece, Fresh, recalls the "supernatural manifestations" that Sylvester Stewart (Sly Stone) must have first been drawn to growing up singing with his siblings in the Church of God in Christ. It's also slightly ironic. The track, which recalls the earliest days of Stone's musical interests, performances, and recordings in the Church (he was nine at the time he recorded his first 45rpm gospel single), was recorded in the midst of his drug-laden decline from atop the pillars of success that he built with the Family Stone, the first fully integrated, bi-racial, bi-gender band that played its first gigs on the San Francisco scene in the late '60s. With their inclination to work heavy R&B leanings into rock blended with the accessibility of pop music, the Family Stone's phenomenal sound and unique makeup took them on a journey that left the stage sizzling at Woodstock, left audiences breathless (and some audiences frustrated) at venues across the globe, and produced some of the most innovative recordings of ‘60s and ‘70s. The Family Stone's story is one of music, love, fame, broken relationships, hope and despair, centered on beautiful compositions, the [sometimes] mad genius, and the [sometimes] clear vision of Sylvester Stewart, aka. Sly Stone. The story of one of the most landmark groups of all time, as told by Jeff Kaliss, begins as an engaging look into the lives of brothers, sisters, and high school pals with a mutual love for early rock 'n' roll and R&B while living in the community of Vallejo, Calfornia, just on the northeast outskirts of the Bay Area. What's most fascinating is Kaliss' remarkable look into the life of the pre-Family Stone Sly as a promising young singer, instrumentalist, and producer, with an extraordinary ability to make contacts through the intricate networks of the music industry and the burgeoning San Francisco music scene. He provides an insightful account of Stone’s first musical endeavors, including honing his chops on a variety of instruments, working with several R&B bands and forming the Viscaynes, an outfit that recorded several 45rpm singles and scored a minor hit with "Yellow Moon" in 1961 on the KYA Top 60 Chart, a popular San Francisco station with a reputation for breaking artists. Although the Viscaynes had disbanded by the time their music hit the airwaves, Stone had solidified his decision to continue pursuing a career in the music industry. Kaliss’ account eases into the next phase of Stone’s career as the aspiring multi-instrumentalist and songwriter began to study music theory and history with mentor David Froehlich at Vallejo Junior College. The time spent studying the works of Bach and other composers left an indelible mark on Stone, as later explored in great depth and detail when surveying his elaborate orchestrating, arranging, and recording techniques while in the studio. The author ably describes the budding artist's growing talents as a skillful producer for Autumn Records, a small label formed by Tom Donahue and Bob Mitchell -- two DJs "who'd reportedly fled west from Pittsburgh's WIBG under threat of federal prosecution for the not uncommon practice of taking payola (basing radio playlists on bribes from record companies)". At this juncture, Stone is given the liberty to experiment with his craft in the studio, gaining a masterful working knowledge of early '60s pop and soul music, turning the music inside-out to find the spot where the two genres' spheres crossed, and subsequently finding the path to his own musical voice. Sly Stone's time as producer for Autumn Records can be heard on the 28-song anthology Precious Stone: In the Studio with Sly Stone 1963-1965 (Ace Records, 1994). 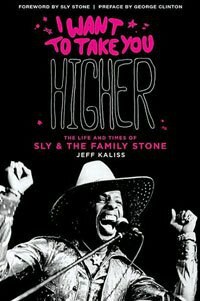 Kaliss' interviews with Stone's associates and acquaintances with whom he had worked during this period provide an interesting view of the early Sly Stone, a young, hungry talent with an eagerness to learn and take on several projects simultaneously, producing countless singles for the Autumn label while putting his own tracks to wax. Here, by the author's portrayal, Stone is focused, charming, and inspiring. I Want to Take You Higher continues on as Sly links up with several area musicians who would form the first incarnation of the Family Stone. Kaliss swiftly moves through the equally swift period when Sly & the Family Stone fashioned an equally captivating sound and image, barnstorming the stage at Woodstock, and touring and recording for the next several years. He also interestingly delves into Stone's curiosity in unique recording techniques and the production of artificial rhythm, including his early forays into tape loops and his pioneering use of early drum machines. Here, Stone's creativity flourishes -- but he begins to display the inability to handle his personal demons and his focus begins to slip -- but the story is still gripping. Once Sly pulled up his roots in the West Coast and became more of a fixture in New York City, he began his decline into hard drugs, which quickly became easily accessible with fame and fortune as the Family Stone's recordings continued to transform notions and stretched the fabric of rock 'n' roll with their electrifying injections of soul, R&B, pop, and funk. Stone begins a steep and steady descent into a career and creativity-killing lifestyle. It's at this point in I Want to Take You Higher when the story becomes less intriguing from the vantage point of musical development -- and more saddening. Kaliss' depiction of a drug-laden Sly, in-and-out of rehab and devoid of the passion and drive that once fueled his musical quest, is heartbreaking and frustrating at once. It's a sad, but true tale of the disillusionment and decay of a legend. However, where Kaliss succeeds (and excels) in I Want to Take You Higher is in his outstanding descriptions of the Family Stone's musical chemistry and the bonds formed and broken between band mates over the years, placing it in the context of a rapidly shifting society and its ideals from the '60s into the '70s. As a whole, Kaliss' story leaves one with a deeper appreciation for the groundbreaking work of a band that crossed lines of gender and race, putting the music first, producing an impressive body of work and leaving behind an incredible legacy that is still felt and heard in recorded music today.